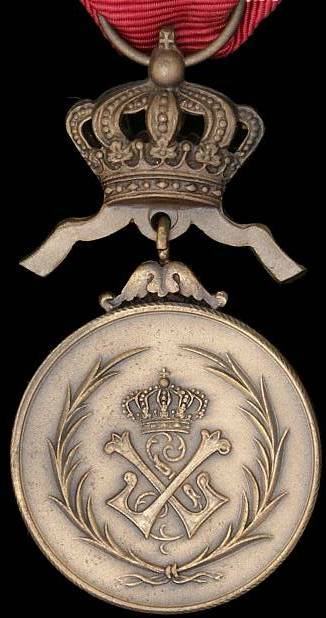 Medal of the Order of the Crown. Medaille du Ordre de la Couronne. 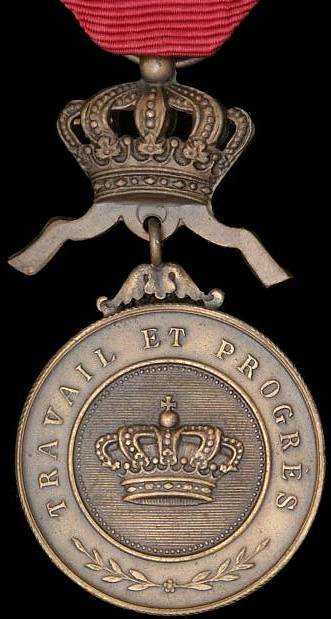 The medal which is attached to the order is primarily awarded for long service at retirement. 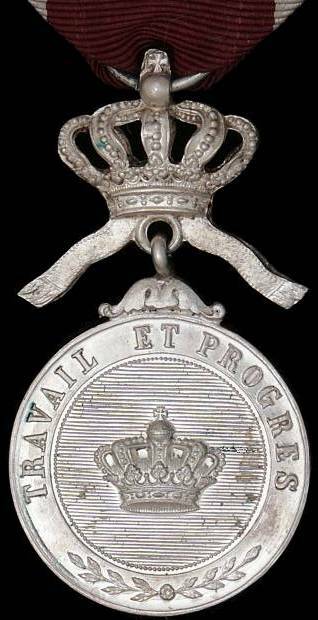 The medals can be awarded to certain private sector employees as well as the public sector; such as prison supervisors, ushers, burgomasters, police commissioners, rural guards (rural police officers) echevins (citizens who sit with judges) secretary to the Octroi (local tax collectors) etc., etc. The recipient would have served 25 years minimum at the time of transferring to pension. To receive the gold medal the recipient would have reached a minimum age of 60 and served 45 years, 30 of which would be with the same employer, or 40 years with the same employer irrespective of age. 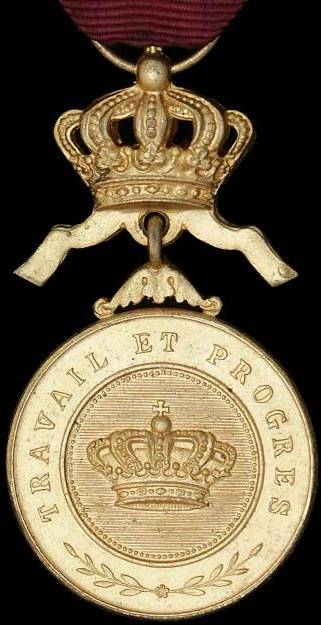 The bronze medal appears to have be confined mainly to the Caucasian workers of the Belgian Congo / Free State for 11 years service, apart from a period - duration unknown - when it was also used in Belgium to reward the fireman and rural guards for 40 years service. 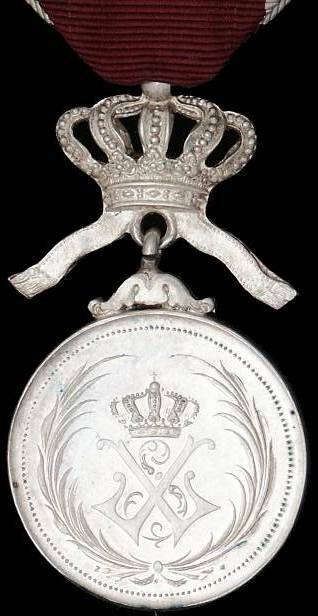 Description: 31mm diameter in gold, silver and bronze versions, the suspension is in the form of a royal crown with two pendelia and a ribbon ring - this is attached to a small fixed ornate ring attachment on the disk. Obverse: a finely ribbed central area with bead surround, with the royal crown superimposed. The surrounding circlet carries the motto of the Belgian Congo; TRAVAIL ET PROGRES (work and progress) - the later issues are bilingual including the Dutch ARBEID EN VOORUITGANG in the lower half of the circlet. Reverse: a stylised 'double L' crowned Leopold II monogram within a palm wreath.